8 entries categorized "Studio Manager Tips"
We all know we should backup our data and most of us do backups on a fairly regular basis. It is a good idea but most of us don't backup as much, as thoroughly or as regularly as we should. It is human nature to succumb to wishful thinking: "I'm sure nothing bad will happen tonight". Firms with 20 or more employees tend to have decent backup systems in place. Smaller firms may vary. I get some very unpleasant calls for help from time to time. Yes, I've had my own data problems that meant I had to do hours and hours of rebuilding to get my database back with all its current functionality. In my case my hard drive failed and then my backup drive failed while I was working on recovering from backup. I'm writing this as a reminder for my Studio Manager customers. Hard drives fail pretty regularly. Studio Manager holds your mission-critical data, so it can be expensive, time-consuming and even devastating to lose a lot of your data due to file damage or loss when a recent backup isn't available. Do Archival Backups. You can overwrite your backups sometimes, but you need snapshots of your data at different points in time because you may not notice a data problem right away. If you backup over a previous backup and you've got a data problem, your backup will also have that data problem. Backup offsite at least once a week. You need to have a strategy to guard against fire, flooding and theft. Many businesses go out of business after a catastrophic event that destroys their on-site computer installation, software, data and all. It is just too hard to recover. You can either have an employee hand carry a drive or DVD offsite once a week or pay for a professional online backup service that keeps your data backed up at a data center. Backup when Studio Manager is closed. If you have FileMaker Server, it can be set to do backups at regular intervals. You can get backups hourly, nightly, exactly what you want. And, FileMaker Server will close your Studio Manager file before it backups up so that all the automatic housekeeping that filemaker does when it closes files is done before the backup is done. Then have your regular backup program backup up FileMaker Server's backups in its regular routine. If you don't have FileMaker Server, you need to do this closing of FileMaker manually before doing backups. The convenience of having FileMaker Server close your files and do automated backups pays for it right there in most cases. Backup nightly, weekly and monthly. Here's a suggested backup schedule: daily keeping the last weeks worth of days, weekly, keeping the last six weeks, monthly keeping the last six months. It is not unusual to run into a data problem that is subtle and goes undetected for more than a couple months before you realize you have a problem. It is good to have your weekly and especially monthly backups both onsite and offsite. That's all there is to it. Make it easy on yourself and get religious about backing up your data. If you currently use FileMaker Server to serve Studio Manager to your users, you need to know about this product. It will let you administer FileMaker Server from your iPhone or Treo. The product is called AdminAnywhere and FileMaker is featuring it here. FileMaker lists it for $49! You won't have to go to your desk or the server room to handle a server admin task anymore. You can even monitor and run your backups from your phone. Click here or on the photo to enlarge it to full size. Some users have gotten error messages when trying to open their FileMaker 7 or 8 databases in FileMaker 9. This is true even though FileMaker 9 has the same file format as FileMaker 7 and 8 and is meant to be 100% compatible with all existing FileMaker 7 and 8 databases. I wanted to comment on what I've learned about this so far. Apparently, FileMaker 9 is more rigorous than previous versions of FileMaker in checking for errors before opening a file. When it finds something not to its liking, it puts up a message advising you to recover the file. I would advise against this if at all possible. The Recover command in FileMaker really is not a good therapeutic tool. It is instead best for situations where you must recover your data temporarily as it is not guaranteed to leave your database completely in tact. So, use Recover when you must get data because there is no other option and then it is best to use a clone of a clean previous version of your database and import data from the recovered file to the clone. Better still, would be to export data from the recovered file and import that exported file into your clone. The point is, don't use Recover before trying other much better options. The option I like best is to open the errant file in the highest version of FIleMaker it will open in that you have and use the Save a Copy as command to Compressed Copy (smaller). This is not the normal kind of file compression but is instead a unique-to-FileMaker cleaning process that is lossless and actually good for the file. I have yet to have a FileMaker file that did not open in FIleMaker 9 after it was first Compressed by an earlier version of FileMaker in this way. I recommend that before you try to open your FileMaker files in FileMaker 9 for the first time, that you do this maintenance step first. If you are running Studio Manager 7x on FileMaker 8, we advise you to use FileMaker 8 version 1 until version 3 is made available. FileMaker Inc. issued FileMaker 8 version 2 to address some issues that were found in version 1. They addressed these successfully but introduced some architectural changes that created other new issues. The original issues in version 1 should not be a problem for Studio Manager users unless you are aggressively customizing the application in ways that version 1 had problems with. If you aren't already aware of the now well-documented issues, take a look at today's post on my FileMaker Fever blog entitled: Documented Issues in FileMaker 8 v1 and v2. FileMaker 7 dramatically improves the speed of remote access. This means that if you are running Studio Manager 7 or above, you could be accessing your Studio Manager database from wherever you are. As long as you have a home computer or notebook running FileMaker, you can log-in and get really good performance even when you are away from your office. I have a big Studio Manager client on the East coast that I support remotely. I am not limited in what I can do. I do major work for one or more hours cross-country without a problem. If I need to double-check something offline, my clients will send me a copy of their version of Studio Manager for testing purposes, but that's actually a fairly rare requirement. Usually I can safely work live. I would love it if every one of my Studio Manager 7 or 7.5 customers set themselves up for remote access. That way when you need me, I'm able to log-in and discuss the issue and fix it for you right then and there. It's really convenient. Also, when you have a question, I can look at your database live rather than struggle with you explaining exactly what's going on even though I can't see the screen. If I can access remotely, you don't have to take the time to compress your file and send it to me for an overnight review or upgrade. The problem of making sure you don't change the database or need it while I have it and am working on it goes away. No need to wait for a weekend when work needs to be done. I can just log in and get it done for you painlessly. See my post on FileMaker Fever for details on how this can be easily set-up. If you are still running Studio Manager on FileMaker 5 or 6, this is one big reason you might want to seriously consider upgrading to FileMaker 8 and Studio Manager 7.5. I'm playing around with my Studio Manager product to see where clairvoyance and the list control can be used to make data entry easier than ever in FileMaker 8. Here's my Vendor Entry screen with my basic address information showing. 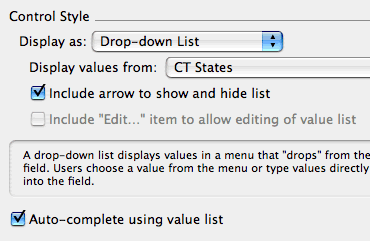 Notice that I've added a little list control arrow at the right end of Title, Company, City, State, Zip and Country. These arrows rock. Now you have a choice when you enter a new address. You can pop-down a value list if you are selecting a common value Title or entering a person for an existing company. Or, you can just start typing and clairvoyance will kick in to help auto-complete whatever you type. This is extra-strength ease of use! By the way, I've written a companion post on FileMaker Fever with a couple other tidbits in case you are interested. I've already finished the user manual for Studio Manager 7, but that doesn't mean it can't be improved! I somehow managed to lure Kathy *Scout* Tomyris back to review every word in the new manual and mark it up with red ink. I will be doing the typing and writing in the fabulous Pages software and when it's done, we'll be sending it out to every Studio Manager 7 customer as a pdf. We are targeting July for this full update to the manual, but I may send out a v1 beta of it with the new improved format before then. It explains everything you need to know. Studio Manager is one of those pieces of software where it is really true: RTFM! If you can't find something in this manual, it probably doesn't exist. The reason I mention all this is that only a few of our customers crack open the manual. And I just want you to know that you are missing a lot if you haven't read the manual. We have lots of real world wisdom in there on how to get the most out of Studio Manager and, incidentally, how to be more successful in running a creative services business. As most of you know, I've been specializing in serving the creative services sector since 1986 and Scout was already working as a designer at that point. Because we serve a global market and many of our customers can't afford to hire a consultant to walk them through the process of setting up and using Studio Manager, we think the user manual is a key ingredient in the success of our product. We may never meet you, so we want to extend ourselves in your direction by helping to ensure that you have a great experience and get a lot out of Studio Manager. Another option would be an *old* eMac running at 1 ghz or even 800 mhz. Depends on how many concurrent users you are expecting. If you are a small shop with 5 or 6 users, I would go with the 1 ghz. If you don't need the FileMaker Server software, these are still great little machines as dedicated FileMaker application servers running plain old FileMaker in small installations. I like lcd displays for human beings who work in front of them all day because they don't radiate you like CRTs. But servers tend to just sit there without a user the vast majority of the time, so the CRT doesn't hurt you. If you are a bigger firm with more than 10 concurrent users, you might want to look into a G5 box of some kind. Don't forget to add at least a 512 mb RAM upgrade (not from Apple) to make this baby sing. You can get one for less than $100. As I write, one of my favorites, Other World Computing, has this RAM for $89.95.